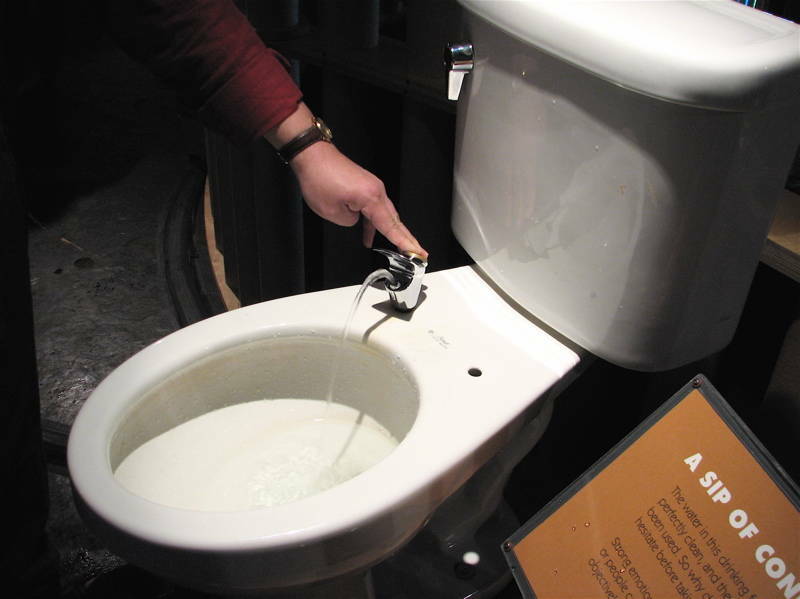 California's drought has spurred interest in treating wastewater for drinking. For decades, some areas of the state, notably Orange County, have resorted to indirect potable reuse – treating wastewater to drinking water standards, but then filtering it back underground to mix with groundwater before pumping it back out for drinking. But now the State Water Resources Control Board, prompted by the legislature, has tasked a panel of experts with determining whether it is feasible to develop criteria for direct potable reuse (DPR) – where wastewater is treated for drinking and then piped directly to customers without first being mixed in a reservoir or groundwater aquifer. The panel is set to deliver its report later this month, as is a group of stakeholders. Then staff from the Water Board’s Division of Drinking Water will use those two reports to develop their own recommendations on the feasibility of DPR criteria by September 1. After a 45-day comment period a finalized report will be submitted before the end of the year. If, as is most likely, the final report does find that the criteria are feasible, the Division of Drinking Water will begin work on developing the appropriate regulations for direct potable reuse. To better understand the factors at play in the report and the possible future of potable reuse in California, Water Deeply spoke to Jeffrey Mosher, executive director of the National Water Research Institute, who is the expert panel’s administrator. Water Deeply: You are part of the expert panel that has been convened. Who else participates in that and what are you tasked with doing? Jeffrey Mosher: The expert panel weighs in on the idea of if it is feasible to develop DPR criteria in California. What we mean by that is, can we develop regulations that are protective of public health? So the expert panel is made up of a lot of researchers and PhDs and academics, and the idea is that they are on the cutting edge of a lot of the research and understanding in the field. There are also particular backgrounds represented – epidemiology, toxicology, chemistry, microbiology, risk assessment – and a lot of those are public health related. Water Deeply: Why is there a push now to look more closely at DPR? Mosher: We’ve done a lot of indirect potable reuse (IPR) but in order to do IPR you need an environmental buffer – a groundwater basin or a large surface water reservoir. Many communities don’t have that. DPR provides some additional operational flexibility. For example, your wastewater comes out of a treatment plant, but your groundwater basin or reservoir may be far away or it may be already full. Or it may not be large. So having DPR gives you a lot of more flexibility for potable uses. Water Deeply: Are there places already doing DPR that we can look at for best practices? Mosher: It’s practiced in Windhoek, Namibia, in Africa. And there is a DPR facility in Big Spring, Texas. These communities hit a wall – they literally ran out of water and it was the only water supply they had left. Typically it’s water you control. You already have it so you don’t have to pay a lot of money to obtain water rights or to buy water on the market. Frankly, the other reason it is so attractive is that it’s so reliable; it’s going to be there every day, year to year. Regarding our imported water, whether it’s from the Colorado River or the State Water Project, there have been some issues on its availability, so that means it is not as reliable as it has been. We have the technology to do DPR. What we are missing are the criteria or the regulatory approach on how it would be permitted. Water Deeply: What are the risks or concerns in doing DPR? Mosher: There are the same risks that are associated with IPR as well as traditional drinking water. It’s just that because the source is wastewater, we have a lot more pathogens in there and potentially we have a lot more chemicals from things like cleaning products or anything that goes down a drain. We still have pathogens in surface water, but with DPR they will be a lot higher, so we have to have appropriate treatment to address higher levels of pathogens, which we know how to do. And we need to be able to treat for the chemicals that are harmful – it’s just something we have to manage. We have treatments to remove them but they can occur at very, very low concentrations and we just need to be able to continue to study those to see if there is ever an issue with them. Water Deeply: What have been some of the findings of the expert panel so far? Mosher: Because we want to look at things like DPR there are some things we need to chase down, such as what are the best procedures from a treatment point of view, what are the technologies we need to consider, what are the appropriate water-quality standards. Monitoring is also a big part of it. We need to identify if there is off-spec [below standard] water and then have procedures to address that. The technology is in place in some of the IPR plants, like the Silicon Valley Advanced Water Purification Center – reverse osmosis, ultraviolet, advanced oxidation – those are the advanced treatments that have the capability of removing chemicals and pathogens. We are learning a lot from those facilities that are already in place.